9:45 And an unfinished project. I had another epiphany tonight. It actually came from the project I started last night. I was angry and frustrated last night because I allowed too many outside influences to get in the way of my art. As a result I was sitting outside last night racing to get something done. I ended the post with “see you in the morning”, but you didn’t hear from me because I didn’t work this morning. I spent the day out enjoying time with my husband. I’ll get to my epiphany in a moment, but first let me explain how it came about. I was so hard on myself last night for not finishing a project yesterday. Then today I was putting incredible pressure on myself to finish not only last night’s project, but thinking I had to get a second project done for today. Epiphany number two, I started the blog, I make the rules. Yes, I said 365 project. Does that mean I will complete 365 projects? I thought so, but then that would mean I could never accomplish anything on a large-scale, or with any real meaning. That would be me doing homework every night for a year, throwing things together just to get something done. That won’t help me accomplish what I set out to do, and that is to find out who I am as an artist. So, new rules. I will work for 365 days, I will use what I already have, but it won’t always be a different project every day. Some days I could end up putting up more than one. It will be what ever it is. The box is beginning to tell its own story, I don’t know if it’s a long or a short one. Time will tell. I will write and share every day, I will show both finished work and work in progress. I was putting unhealthy pressure on myself. No more! So, here is what has happened to my box today. I finished the outside decoupage, and started working on the inside. It is turning out to be a very personal piece. I will explain more about that tomorrow. 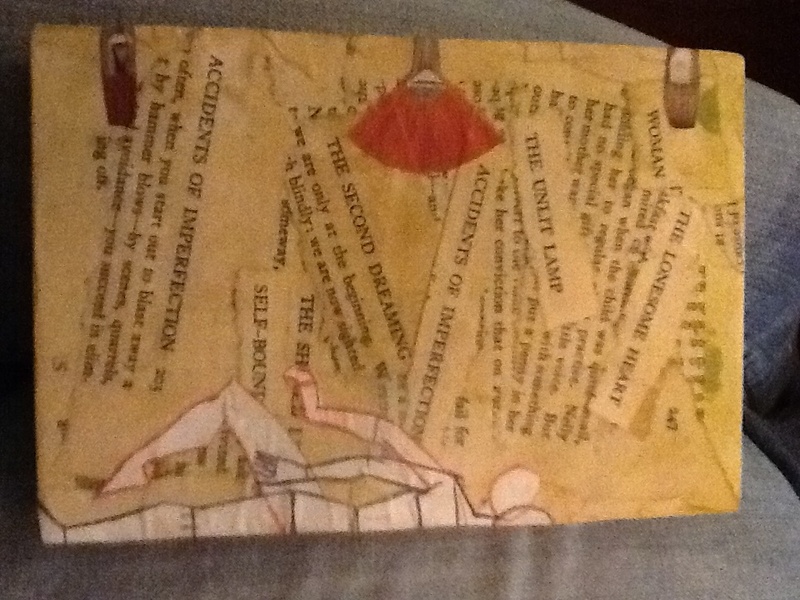 This entry was posted in Uncategorized and tagged altered art, art, decoupage, epiphany, pressure, writing. Bookmark the permalink.